Corruption undermines service delivery, economic growth and the effective use of limited resources, both in government and the private sector. It's a danger to our economy and the wellbeing of those who rely on government services. It's important that we report fraud, corruption and the misuse of government funds and property when we see it. Corruption can take many forms, but basically it happens when someone uses their position of power or authority for personal gain or to benefit someone else. Offering or accepting a bribe. Taking friends and family members on official trips. Giving contracts to friends and family members. Corruption can often be difficult to spot, though. 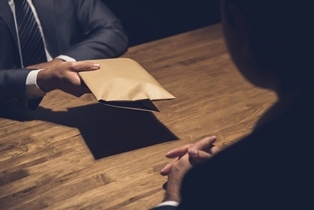 Sometimes the difference between building normal relationships with service providers and corruption can be blurred, especially when it comes to activities such as working lunches and off-site meetings. However, the best question to ask is "if I accept this, will it unfairly influence my professional decisions?" If the answer is yes, then there is a risk of corruption occurring. Corruption is closely linked to fraud and theft. Fraud happens when someone lies to benefit themselves or cause someone else harm, financially or otherwise. Theft is when someone takes money or goods that don't belong to them. All of these are illegal and can happen at any level of government, and the South African government has created structures to help combat corruption, fraud and theft in the public service. You can help fight corruption, fraud and theft in government by phoning the national toll-free anti-corruption hotline on 0800 701 701. It's also important not to pay any bribes asked by a government employee or to offer any bribes to government employees. Not only does this promote corruption, it makes it harder for everyone else to get access to government services without being expected to pay a bribe! The Western Cape Government is committed to fighting corruption, fraud and theft, and this fight is central to achieving our goal of creating an open-opportunity society for all. Fraud and corruption can also be reported at the Office of the Public Protector. The Public Protector can investigate government officials at any level, including national, provincial and local authorities and anyone who performs a public function. Read more about how to report corruption, fraud and theft. Find out more about South Africa's campaign against corruption at the National Anti-Corruption Forum.